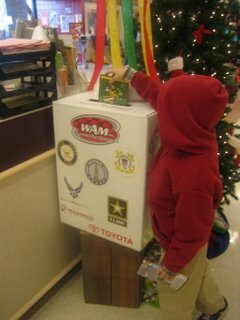 Each year, we try very hard to introduce some sort of charitable event to our kids. We should do more throughout the year and I always intend on it, but giving at Christmas seems automatic and easy with so many opportunities. This year, with being new in the area, I did a search on the internet and found a great site that includes information on a DVD Drive for the Marines. 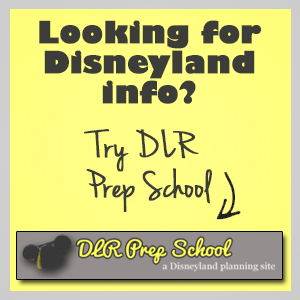 If you live in the immediate area, click here for more details. 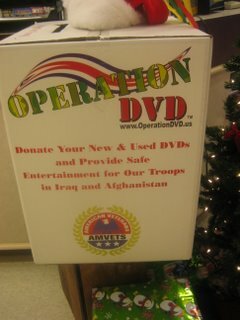 It's such a simple thing to do...donate new or used DVD's to this organization and they'll make sure the troops get them overseas in Iraq and Afghanistan. There are ways to help just about everyone in need this time of year. If you're interested, do a search on the internet in your area, or simply go to www.charity.com. Even if you can't give a lot, every bit helps!